Linlithgow Palace is one of the most visited Historic Environment Scotland sites in lowland Scotland, and the birthplace of Mary Queen of Scots. In this post I want to concentrate on the outside of the palace, and something many visitors might miss. As you approach the palace along Kirkgate you firstly come to an outer gateway. This was a later addition to the palace, built by James V around 1535. Once through the outer gateway the current entrance of the palace is in front of you. This is the “new” entrance, built on the orders of James V as well. To see the original entrance to what was then a much smaller palace, walk to your right along the external wall. Turn the corner and you come to the east wall of the palace. This is the oldest part of palace, built by king James I. After a major fire in 1424, James 1 decided to have a new palace built to replace an earlier building that had been destroyed. The palace was extended by subsequent monarchs. James I’s palace was largely the east range of the current palace. To build it James had to raise taxes on his nobles, which was one of a number of factors that resulted to him being stabbed to death in a sewer, but that is another story. Above the door in the image is the royal coat of arms surrounded by angels. On each side of the emblem are recesses into which the wooden supports used to raise and lower the drawbridge would have fitted when the drawbridge was in an upright position. Beside the drawbridge there are recesses where statues would have been displayed, Historic Environment Scotland believe the could have been statues of St Andrew and St James. Mary was born in the palace on 7 or 8 December 1542, and spent the first seven months of her life there. Mary’s father James V died a few days after her birth of a fever made worse by depression following the defeat of his army at Solway Moss. Mary’s mother, Marie of Guise, arranged to take Mary for safety to the much more defensible Stirling Castle, whilst some of the Scottish nobles argued and schemed about who should control the infant queen, and therefore be able to rule Scotland in her name. There was also a risk from agents working on behalf of Henry VIII. Henry intended that, by agreement or by force, his son Edward would marry Mary, giving Henry effective control of Scotland. The gateway to the palace. Note the gun ports – this palace was defended! Mary didn’t return to Linlithgow until she came back to Scotland to rule as Queen of Scots in 1561, and even then she only visited for short stays. Her last visit was in April 1567, on the eve of her abduction by Patrick Hepburn, Earl of Bothwell. Linlithgow Palace is now a ruin, but a magnificent ruin. In 1746 a fire was started by the Hanoverian troops billeted there. The fire destroyed anything not made of stone. The Hanoverians were pursuing Bonnie Prince Charlie’s army which was retreating north, ultimately to the disaster of Culloden. How much more magnificent the palace would have been if the barbarians had not started a fire. Linlithgow Palace is built on a slight promontory into Linlithgow Loch. Roman pottery discovered during archaeological digs indicate that the promontory was inhabited in Roman times. The palace is about half way between the royal castles of Edinburgh and Stirling, making it a convenient stopping off point for a royal party travelling between them. Edward I of England had the area fortified in the late 13th century as part of his attempt to subjugate Scotland. But the palace that Mary knew was started by James I, following a disastrous fire in 1424 that destroyed much of Linlithgow. Several Scottish kings extended and added to the grandeur of the building in the centuries that followed. Mary’s grandfather and father, James IV and James V, transformed the building into a magnificent renaissance palace, built around a central courtyard. James V added the beautiful fountain, to make a focus in the courtyard. It still works and is operated on occasions in the summer. James V also added an outer gateway, with four panels above displaying the coats of arms of the main chivalric orders which he was a member of. He was in some very prestigious orders; the Garter of England, the Thistle of Scotland, the Golden Fleece of Burgundy, and St Michael of France. The panels that exist today are 19th century replicas of the originals. By the time of Mary’s birth, Linlithgow had become the most impressive palace in Scotland, and had been the favourite of several Scottish Queens. Mary’s mother Marie considered Linlithgow Palace to be the equal of the noblest chateaux in France. Soon it was to be joined by the palace in Stirling Castle, as building work there was nearing completion when Mary was born. Just outside Linlithgow Palace is St Michael’s Church, where Mary was baptised. The building, which dates from the middle of the 15th century, was once elaborately decorated, as befits a building where Scottish kings and queens often worshiped. However, a great deal of damage was done to the ornamentation in 1559 by Protestants when they defaced many elaborately decorated Catholic churches and abbeys, and it is much plainer now. So much beauty was vandalised during the reaction against Catholicism. However new stained glass was added in the 19th century, and in 1964 a rather flashy aluminium crown was added to the roof. Last week I visited Stirling Castle. It is my favourite castle in Scotland – I prefer Stirling to Edinburgh Castle. In Edinburgh the main royal palace is a mile away at the bottom of the royal mile – Stirling is both a defensive castle and a magnificent palace. Also Historic Environment Scotland has spent many millions of pounds restoring part of the castle to what it would have been like in the 16th century. Some photos of this great castle follow. But Stirling has a dark connection to my clan. The Earl of Douglas was murdered here by James II in 1452. At that time the Black Douglases were the most powerful family in Scotland apart from the royal Stewarts. James II was concerned that the Earl might be conspiring against him, and so invited him to Stirling Castle, enticing him with a safe conduct. There he personally stabbed the earl to death, and some of his courtiers joined in the murder. The Earl of Douglas’s body was thrown out of one of the windows in James’s palace into what from that time has been known as the Douglas garden. When a child James had also been witness to the murder of a previous earl of Douglas. In 1440 when James was only 10 years old, and Scotland was being ruled by his advisors, the 16 year old 6th Earl of Douglas and his younger brother were invited to Edinburgh Castle, and in what is known as the Black Dinner were executed by James’s advisors on trumped up charges. Young James tried to stop the murders, but to no avail. It is safer to live in the 21st century than the 15th! Rather fittingly James II was to die when one of his cannon’s exploded at the siege of Roxburgh Castle. I for one am not unhappy about that! There is one other more touching thing to see in the Douglas garden. When the infant Mary Queen of Scots was held in the castle for her safety, she was too small to see over the battlements. So a hole was made in the battlements so she could look out on her realm. The main gate to the castle in medieval times. The towers beside the gate would have been considerably higher – they were lowered in the 1700s as by then high towers were vulnerable to artillery fire. The Douglas Garden in the castle. Mary​ Queen of Scots little “window” in the battlements. Today I went to Salisbury with my photographic group. The weather wasn’t suitable for outdoor photography, so we spent most of it in the cathedral. The first photo is the mechanical clock which used to be in the cathedral’s bell tower, but is now in the cathedral itself. It is the oldest mechanical clock in the world, built in the 14th century. It has no face – it simply rings the hours, you have to guess the minutes when between hours. It was in constant use until 1884, but now is only operated on special occasions. Pictures 2 and 3 are the famous font – really impressive, and providing beautiful reflections of the cathedral. Just seeing the font itself is reason enough to go to Salisbury. Work was being done on the massive cathedral organ, and consequently scaffolding ruined some standard cathedral images. Also the Magna Carta which Salisbury holds wasn’t on display. Following an attempt to steal it last year (when luckily it wasn’t damaged), a more secure case is being developed for it. So I looked for other things. Image 4 is nearby Stonehenge. Well not exactly Stonehenge itself, but a replica in the chocolate shop near the cathedral! I saw the Mary Queen of Scots film yesterday and was disappointed in it. I think they really needed two films, and MQoS 1 and 2, just to cover Mary’s personal reign in Scotland – only six years and nine months, but such an eventful time. I would have ended part 1 at the birth of her son, in many ways the highlight of her reign. Part 2 would have been Mary’s downfall. Because of the time constraints they missed so much out, as well as summarising events and therefore introduced historical inaccuracies. Overall disappointing, and too many inaccuracies. And the weather, though not exactly great in Scotland, isn’t that bad all the time. VisitScotland must have been ringing their hands – not a great advert for this beautiful country. Though I imagine the rain and mist helped cover up quite a few 20 and 21st century power lines, roads etc. from the camera. I am also really surprised they couldn’t use more relevant sites – Mary isn’t associated with Blackness Castle which seemed to be her home as far as the film was concerned. Why not use Edinburgh Castle, Falkland Palace etc. Mary Queen of Scots must rival Robert the Bruce as the most famous Scottish monarch, and the period in which she lived was one of the most exciting and turbulent in Scotland’s history. And since much of Scotland’s history is turbulent, that is quite an accolade. This weekend sees the release of a major film on Mary in the USA. When writing this I don’t know how historically accurate the film will be – often films diverge from the historical facts. I have been fascinated by Mary and her time since I was a teenager, and have just published a book about her. I haven’t seen the film yet, as it will not be released in the U.K. until 18 January, but based on the trailer there are some inaccuracies in the film. I have just published a book which is the true story of here Scottish years – details at the end of this post. Linlithgow Palace, where Mary was born. Mary was Scotland’s queen from a few days after her birth at Linlithgow Palace, as her father James V died before she was a week old. When she was an infant England’s King Henry VIII wanted her to be contracted to marry his son Edward. This in practice would have given Henry control of Scotland. Initially the Protestant faction in the Scottish court agreed to this, but this arrangement was rejected when the Catholic faction in Scotland regained ascendancy. Henry’s response was to send armies to devastate much of the Scottish borders and lowlands, in an attempt to terrorise Scotland into agreeing to the marriage. These terror tactics were to become known as the “rough wooing”. The English raids and military incursions continued for several years. So at five years seven months Mary was sent to the sophisticated court of France for her safety, and in preparation for her marriage to the Dauphin, the heir to the French throne. At fifteen she married the fourteen year old Dauphin, who when his father died in a jousting accident shortly afterwards, became King of France. Mary was for a short time the Queen of France, but had to return to Scotland at eighteen following the death of her young husband from an infection. Mary attempted to rule Scotland at one of the most tempestuous times in its history, only one year after the country had officially become Protestant, and when a very substantial minority of the population were still Catholic. Mary was a Catholic when many, although not all, of the Scottish nobles were Protestant, a recipe for conflict at a time of religious strife. Scotland had adopted an austere version of the Protestant religion. Although the Scottish church eventually matured into the tolerant and compassionate church it is today, the 16thcentury was a time of religious extremism. Catholics and Protestants struggled for supremacy, and many people in both churches were bigoted and intolerant, seeing adherents of the other religion as heretics rather than fellow Christians. In some ways Scotland then was like Afghanistan is today, a country with a weak central government, where much of the real power lay with warlords. Again like Afghanistan the county had been racked by war and the intervention of foreign powers for decades. In Scotland’s case England and France, in Afghanistan’s first Russia and then the West. Mary’s task of ruling the country was almost impossible. Mary’s rule when she returned to Scotland started well. She was an attractive and charming young queen, and initially her subjects took to her. Her policy was one of religious tolerance. She insisted on practicing her Catholic faith, but did nothing to threaten the official Protestant faith of her country, although the Protestant church undoubtedly felt threatened. But she made several significant errors of judgement. She married Lord Darnley, a superficially attractive young aristocrat, but as mentioned earlier in reality egotistical, stupid, sexually promiscuous and possibly bisexual, and a drunkard. She also had too many close French and continental Catholics in her entourage, including her personal secretary David Rizzio. Rizzio infuriated Mary’s nobles by his haughty attitude and tendency to require a bribe before allowing any favours or access to Mary. To cut a long story short, a group of nobles, including Mary’s husband Darnley murdered Rizzio when he was dining with Mary. This shows how weak her position really was. Three months later Mary gave birth to the future James VI of Scotland in the security of Edinburgh castle. Thirty-seven years later, following the death of Queen Elizabeth I, James was to become James I of England as well. Mary’s marriage to Darnley had irrevocably broken down. However obtaining a divorce would have been difficult, and would have resulted in her son being considered illegitimate, and therefore under the legal code that existed at that time, unable to inherit the throne. Divorce therefore wasn’t an option. Rather conveniently Mary’s husband Lord Darnley was murdered a year after Rizzio. The person responsible was almost certainly Lord Bothwell, one of Mary’s key supporters and possibly by then lover. Historians argue to this day whether Mary was involved. But Bothwell was too powerful to be convicted. Bothwell pressured Mary to marry him, and possibly raped her. Mary then made a disastrous mistake. Three months after the murder of her husband she married Bothwell. Because she had married the man who was generally accepted to be her husband’s murderer, many people thought Mary little better than a prostitute, and said so. Scotland was seething with insurrection. Also many nobles detested Bothwell, and were frightened that he would use his position as the Queen’s husband to threaten their positions. They therefore rose in revolt. This resulted in a standoff rather than a battle between Mary’s forces and her enemies – no one really wanted a civil war. Mary surrendered to the nobles seeing that her position was weak, and believing she would be treated with honour. However they had different ideas. They imprisoned Mary in Loch Leven Castle on an island in the middle of the loch. She was threatened with death and forced to abdicate in favour of her infant son. Loch Leven Castle, a castle on an island. Mary was forced to abdicate as Queen of Scots here. But Mary wasn’t finished yet. After almost a year in captivity she managed to charm George Douglas, the young brother of the castle’s owner, and he helped her make a daring escape. Her supporters rallied behind her, and she soon had an army of 6,000. But at the battle of Langside Mary’s forces were beaten by the nobles. Mary decided to escape from Scotland and seek support from her cousin Elizabeth I of England, a disastrous mistake. Elizabeth, a Protestant queen, saw Mary as a threat, a possible rallying point for the large Catholic minority in England. Therefore rather than support Mary, Elizabeth kept her under house arrest. After 19 years Mary became desperate, and became involved in a plot to depose Elizabeth. As a result, Mary was tried and executed. Mary only spent just over twelve years of her life in Scotland, five years and seven months before being sent to France, and six year nine months when she returned, speaking with a French accent and strongly influenced by her French education. But Mary is the most famous Scotswoman ever. Many books have been written and films made about her life, including the new “Mary Queen of Scots”, released this month. 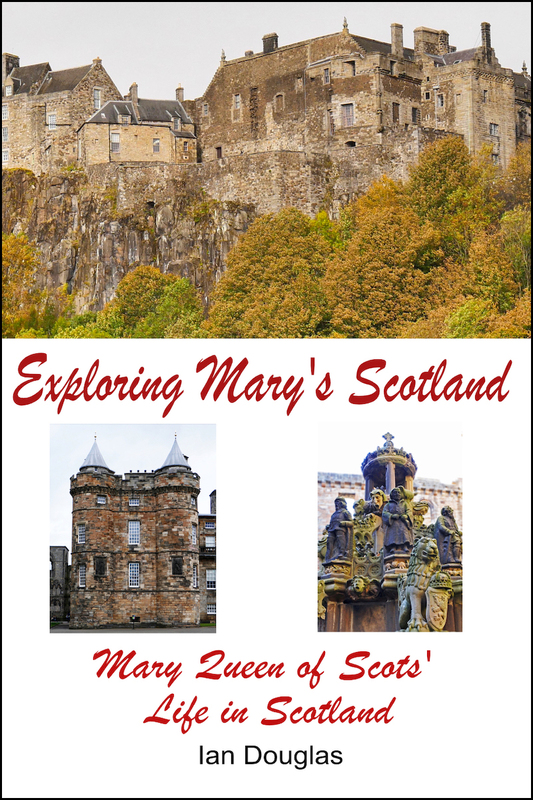 I am pleased to announce the publication of my new book – “Exploring Mary’s Scotland – Mary Queen of Scots’ Life in Scotland” which is available from Amazon. The book is in two parts. The first is an outline of the tragic queen’s life, and the second part is a guide to the most significant Scottish sites closely associated with her. On 8 December in the USA and 18 January in Britain, a major new film “Mary Queen of Scots” staring Saoirse Ronan, Margot Robbins and David Tennant will be released. I can only base my comments on the trailer, since I can’t see the film until 18 January. The trailer has two error. Firstly Mary and her cousin and rival Queen Elizabeth never actually met. Secondly it is unlikely Mary spoke with a Scottish accent, she is more likely to have spoken with a French/Scottish accent, having left Scotland at five and not returned until she was eighteen. However, together with “Outlaw King” about Robert the Bruce, it is to be commended if it increases interest in Scottish history. Long before I knew that the film was being produced I started to research Mary’s fascinating life and times for the book. There are many books in print about Mary and her struggle to rule Scotland at a tumultuous time in its history. How does “Exploring Mary’s Scotland” differ from the rest? As well as providing an overview of Mary’s life, and particularly her life in Scotland, it takes the reader on a tour of the Scottish sites closely associated with her. I believe this helps to bring her life and times alive. And of course if you want to visit the sites, either in person or from an armchair, the book can be your guide. It is a substantial expansion of my previous book, “Mary Queen of Scots – a Brief History,” as it is more than 2.5 times the size. And if you read the book you will be able to judge the film, and point out to your friends and family all the historical inaccuracies!